Do we love BabyBjorn here at Babyology? You bet. Their gear is always stylish as well as practical and functional. Who doesn’t love that? Click through to see what’s new in the kitchen and the bathroom from BabyBjorn. First, there are new brightly coloured BabyBjorn plate and spoon sets. The clover shaped bowl assists the spoon scooping action and the short handled spoon make it easier for little ones to learn how to feed themselves. After all the self feeding fun, you’ll be relieved to learn this plastic ware can go straight into the dishwasher for an easy clean up. Phew! 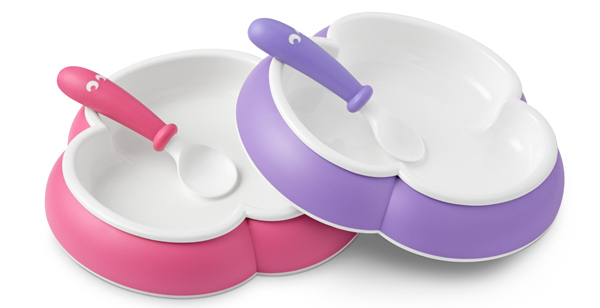 Priced $38.99, BabyBjorn plate and spoon sets are available in twin packs in either purple and pink or turquoise and orange from Minimee. Confidence is a key element with toilet training and we love the new Baby Bjorn Potty Chair. A solid plastic seat with high back means no wobbling, tipping, falling off or falling in the potty. Your child’s back is supported and the comfy wide seat fits toddlers securely so there’s no teetering on the edge. Cleaning the Potty Chair is also super easy with the easy lift out potty insert, which can be cleaned under running water while the seat itself can be wiped with a damp cloth. Available in turquoise (pictured above), grey, red or white and priced $54.99 from Minimee. For more awesome products from this brand, flick through our past BabyBjorn posts.